The Screen Actors Guild Awards were held last night, and they both illuminated and further complicated the impending Oscar race. In a somewhat surprising turn of events, Black Panther took the top prize of the night—Best Performance by an Ensemble—in addition to the Best Stunt Ensemble award. It’s not hard to imagine why actors sprung for the groundbreaking Marvel Studios film in this category, but it did beat out other Oscar heavyweights like Green Book and A Star Is Born for the top prize. Does this mean Black Panther is winning Best Picture? Not necessarily. Only two of the last five Best Ensemble winners went on to take Best Picture at the Oscars, and SAG failed to even nominate another top Oscar contender—Roma—in this category. Regardless, it was a substantial win for the Black Panther team, and Marvel has to be thrilled as they’re just coming off the film’s history-making Best Picture nomination. Star Chadwick Boseman also gave a terrific speech, so who knows? Maybe that’ll sway Oscar voters despite the film getting shut out of other major categories like Screenplay, Editing, and Director. Aside from Black Panther, the SAG individual acting races solidified a couple of contenders. Glenn Close won for The Wife, cementing her current frontrunner status. 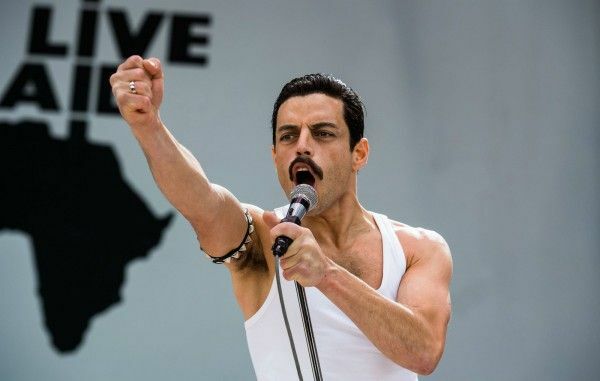 And Rami Malek took Best Actor for Bohemian Rhapsody, beating out Christian Bale and Bradley Cooper. Though I still think Bale has a shot at winning the Oscar, and Argo-like outrage over Cooper’s Best Director snub could finally land him a well-deserved Best Actor prize. For all intents and purposes, though, Malek is now the frontrunner. Only once in the last 10 years has the SAG winner for Best Actor not also won the Oscar prize. And Emily Blunt shook up the Best Supporting Actress race by winning the SAG for A Quiet Place. Regina King, the Oscar frontrunner in this category for If Beale Street Could Talk, wasn’t even nominated by SAG. Many thought Amy Adams would win here for Vice, so Blunt’s win was certainly surprising. On the TV side of things, The Marvelous Mrs. Maisel continues to dominate the awards circuit with wins for Actress, Actor, and Best Comedy while the Best Drama award went to This Is Us.